‘Not In Those Trousers’ is the caption to a hand-painted postcard (the artist has initialed it ‘K.S.’). 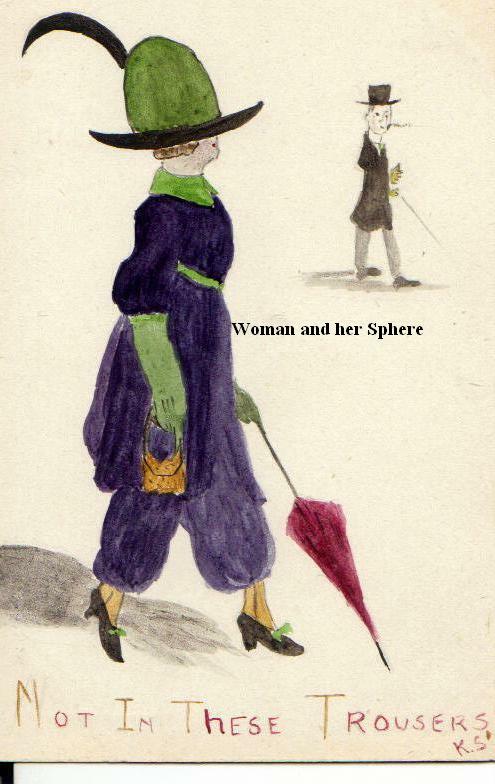 The subject of the remark is a lady in a purple and green outfit – a long tunic over ‘harem’ trousers – wearing a green and purple hat and carrying an umbrella. The author of the remark, a dapper gentleman, stands in the background. I think that, in this case, the deliberate choice of colours may indicate that a suffrage inference might be drawn. The style of dress is, again, very Paul Poiret – see this week’s ‘Suffrage Stories: ‘Madame Mantalini’ post. Very good – unposted. The reverse of the card has a rectangle marked – in the top right – to receive a stamp ‘Inland Postage 1/2d. Foreign Postage 1d.’ £15 post free. This entry was posted on August 1, 2012, 8:30 am and is filed under Collecting Suffrage. You can follow any responses to this entry through RSS 2.0. You can leave a response, or trackback from your own site.